Notice! Club Hotel Falcon does not accept reservations at this time. Please try again later. Club Hotel Falcon Contact. Club Hotel Falcon has been providing service in the tourism and accommodation industry since 1993. Club Hotel Falcon is “Located inside the city, but it leaves the city behind once you take a step through the door”. Guests of Club Hotel Falcon will get the opportunity for a fun, peaceful and comfortable vacation. Club Hotel Falcon has got a sea view with the endless blue, a garden reflecting the harmony of colors, and 225 comfortable and spacious rooms on its 13.500 m² land. Within these three powerful equations with the water-nature and mountain view, you will find numerous alternatives at Club Hotel Falcon. Our hotel is located at Lara, one of the most exceptional shores of the city of Antalya, which is deemed the pearl of the Mediterranean. A vacation at Club Hotel Falcon provides you with more options than just another vacation. You can easily observe the historical and cultural inheritance of Antalya, and discover the city, touristy attractions and museums while also taking your vacation. The hotel is close to shopping malls, popular night clubs and hot spots of the city. 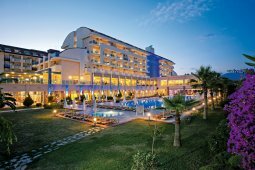 Located 17 kilometers away from the Antalya Airport, 13 kilometers from the Antalya Bus Terminal, and just 5 kilometers from the city center. Being of an organizational concept, Club Hotel Falcon hosts many conferences, meetings, seminars, weddings, birthdays, balls, cocktails and many other similar events. It is a hotel of choice of many groups for their business meetings. Enabling your business meetings to give a vacation-like feeling, our hotel is at your service with its conference halls and all required equipment. It witnesses to the most special moments of happy couples. Our hotel welcomes you and your guests in the most special way as you say the most meaningful “I do” of your life and start a happy life together. Club Hotel Falcon provides its guests with new services each year with its experience in the accommodation industry. To welcome and entertain each guest in high spirits and to see them off on a happy note is the main principle of our international service minded management method. Club Hotel Falcon accepts VISA and reserves the right to temporarily hold an amount prior to arrival. Club Hotel Falcon accepts Master Card and reserves the right to temporarily hold an amount prior to arrival. Club Hotel Falcon accepts Maestro and reserves the right to temporarily hold an amount prior to arrival. Club Hotel Falcon accepts Bank card and reserves the right to temporarily hold an amount prior to arrival. Classical Turkish Cuisine A La Carte Restaurant (Valid for once with a reservation on every Wednesday. Gala attendance is compulsory during New Year's Eve. Mini club opening hours are between 10:00 and 12:30 / 15:00 and 17:30. The facility was built in 1993. Renewed in 2005-2014. The resort consists of 4 kats. Each bloc has 1 guest elevator. Minibars are provided with soft drinks once on the day of check-in. Free internet access is offered in all rooms and public areas. You can enter the pool with Hashema. The meeting room is 700 pax and 670 m² wide. The conference room is 300 seats and 270 m² wide. Tesise is accepted as a pet. Ok, so we chose this hotel as a accomodation on our 2 week vacation in Antalya. We made a reservation for 2 in a handicap friendly room. At arrival we asked if we could change the room if we disliked it. The answer was not at this time because the hotel was fully booked. Once in our room, we wanted to change it because it had the appearances of an empty jailroom. We looked on the internet if the hotel was booked fully. Yes, you can guess, it wasn't. So this made us a little annoyed, after we had dinner, we confronted them with this and they still were in denial. So the next day we checked out and went to a suite accomodation called BMK suites. Great place and we don't have 1 regret left! Swimming not allowed after 7 pm. The breakfast, lunch and dinner hours are also quite restrictive. Peaceful and nice hotel other than that. Nice hotel including diving center. Close to city center. Good price. Friendly staff. Special facilities for honeymooners and newly-married couples. Room decorations and wine are served free of charge on the first night.